The Deluxe Bundle includes Turnstile's album Time & Space on CD. The Bundle also includes the Time & Space T-Shirt, black and white 18" x 24" Poster, and Disco Keychain. All pre-orders include instant digital downloads of 'Real Thing', 'Generator' and 'Moon'. The T-Shirt Bundle includes Turnstile's album Time & Space pressed on CD. Bundle also includes the Time & Space T-Shirt All pre-orders include instant digital downloads of 'Real Thing', 'Generator' and 'Moon'. 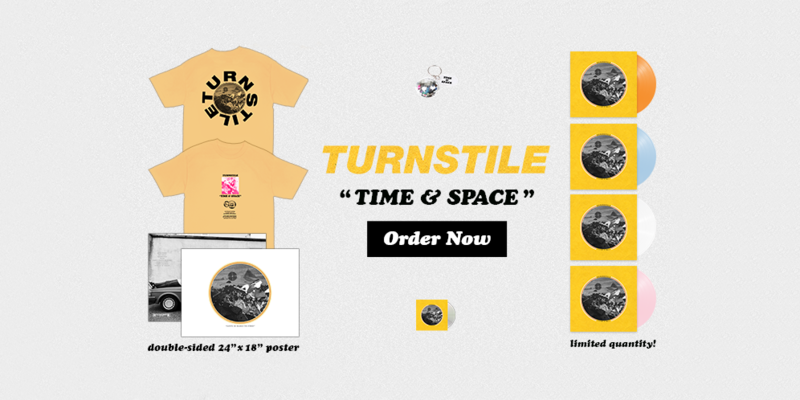 The Poster Bundle includes Turnstile's album Time & Space on CD. The Bundle also includes the Time & Space Poster which measures 18" x 24" and is printed in black and white. All pre-orders include instant digital downloads of 'Real Thing', 'Generator', and 'Moon'. Turnstile's album Time & Space, pressed on a RR webstore exclusive Light Blue Vinyl. The Light Blue Vinyl is limited to 200 units worldwide. All vinyl includes a digital download card.